That caught your attention didn't it? What is an "off the grid" appliance? It's simple really. Any appliance that doesn't require electricity to run it. For about 10 years now we've been making the shift to non-electric appliances around the house. It started with simple things like begging my mother for her egg beater to use instead of my Kitchenaid mixer (which I love and would miss dearly). She gave it up grudgingly and only because she found it difficult to use because of her arthritis. 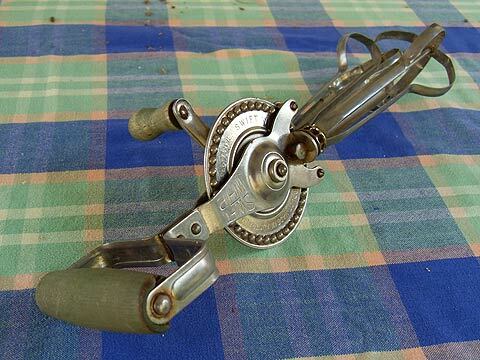 This egg beater is older than me, it was an engagement present for my mother and father back in 1959 and it still whips eggs and batters as good as it did back then. I replaced my V-slicer when I wore it out so I don't need to use the food processors all the time. I've replaced my grater with a whizz bang new one that has a box to grate into and a lid to keep whatever I grate fresh. It's great for small amounts of cheese, one or two onions or carrots and the soap for Cheapskates Washing Powder. And it uses Cath Power, not plug-in power. Even my Fowlers Vacola outfit is a stovetop rather than electric system. We had an electric can opener, but when the boys gave me a fantastic can opener for Christmas a couple of years ago I was ecstatic. It's simple to use, leaves a smooth edge and doesn't require any power to operate it. Actually it's so easy to use Mum can manage it even with her arthritis. They bought it at General Trader if anyone is interested, and it wasn't cheap - it was $29.95 (which is why they shared it). I think t was worth every cent and just as good as the $50 Tupperware can opener my mother-in-law wanted me to buy. The electric can opener was gifted to a friend who happened to mention she was looking for one. Another score off Mum, to use one of the kids' favourite phrases, is the carpet sweeper. Good old Sabco, it's bright blue box hides brushes that do an amazing job of picking up the surface fluff and dust from the carpets. Hannah tells me it's vintage and I should sell it. I tell her it does what I want it to do and it didn't cost me anything, it doesn't cost anything to run, has simple moving parts that even I can repair if necessary and it's staying. Last year I showed Hannah how to set her hair using rollers. Apparently they are coming back into fashion, although the newer versions are rather expensive. I even dragged out my (very) old hot rollers. She was dumbfounded! They don't require any power, but instead are heated by sitting them in hot water for 10 minutes. OK, you might need power to heat the water, but a fire does the job too. And I taught her how to use rags to create soft curls instead of turning on the curling wand. We don't have air-conditioning in our home. Last week I would have really, really liked it and really, really, really used it. But we manage to keep the house cool (-ish) without using power. Awnings are down early in the morning, blinds and drapes are drawn and windows shut to keep the heat out. Sausages not only keep cold winds from blowing under doors, they keep hot winds out too. On really hot days we make sure the television is off. Boy do these new TVs give off some heat! A big screen may be easier to watch but why hasn't someone solved the heat issue yet? For my birthday last month the kids gave me a push mower and I love it. I don't need to bust a kerfoofal valve to start it, I can use it whenever I feel like it, it's great exercise, it doesn't wake the neighbourhood or suffocate me in fumes and it doesn't need to be filled up with fuel. I think this is one of the best presents I've ever had. I love cutting the grass, not that we have much, and now I can do it free of cost and without any impact on the environment. We even have a stovetop coffee percolator. I hunted op shops to find it. It was originally meant to go camping with us, but it makes such a nice cup of coffee I keep it in the kitchen. When someone pops in for a coffee I love to get it out and make them a real cup of coffee. Dependency on electricity has spoilt us. We have everything at the flick of a switch. And each flick costs money. Power bills are going up and up, they're not ever going to come down. As the resources to produce electricity become scarcer prices will rise and I would think access would be restricted. Instead of complaining about the cost of electricity, we should be doing something about how much we use. Choosing a few non-electric appliances to replace your powered ones will stand you in good stead. At the very least you'll save a little money on the power bill, get a little more exercise and add a little more "green" to your life. I've been cutting the long grass in the vegie garden (was a paddock, not yet fully converted) with hedge clippers over the last few days. I did think today that the whippersnipper might be faster but it's heavy and needs earmuffs and is no good around the fiddly bits anyway. So clipping it is. It's been good exercise and surprisingly satisfying. Both the petrol mowers are out of commission (waiting for a minor repair) but the guinea pigs will be moved onto the longest bits tomorrow - if you only have a small lawn they're not a bad option.